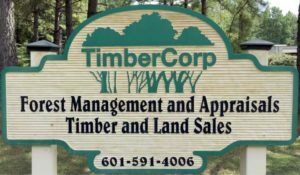 TimberCorp, Inc. is a full-service land management company specializing in forest management assistance to non-industrial and institutional forest owners. We are located in central Mississippi and offer our services to a broad geographic area, which routinely includes all of Mississippi and portions of Alabama, Louisiana, and Arkansas. We can travel to any location and have worked as far away as Alaska. TimberCorp is headquartered in Brandon, Mississippi. The company currently has ten employees, including six foresters. What is your timber worth? How can you get the maximum price for it? When should you sell? Where are the best markets for selling? By utilizing TimberCorp, you’ll know the answers to these questions. Our team of forestry experts is experienced and well trained to assist you. Whether your goal is to sell and receive the absolute highest price possible, or to develop your forest for recreation, or a combination of these, you owe it to yourself to get the most out of your timberland. Studies Show that landowners who utilize a consultant receive as much as 50-percent greater return on their timber. Further studies prove that a well-managed stand can grow timber three to five times more valuable than the same stand if left unmanaged. For these reasons, the earlier you contact your full-time timber management experts, the greater your pay-off will be. Our fee structure is flexible to best meet the needs of our clients. We offer a choice of pricing structures including hourly rates, a per-acre charge, a contract price, or a commission on sales and leases. Your timberland could be your most valuable renewable asset. Without proper management, many years of development may be needlessly wasted. With proper management and marketing, it can become one of your most productive assets. TimberCorp is ready to help you make these important decisions. Copyright © 2017 TImberCorp, Inc. All rights reserved.